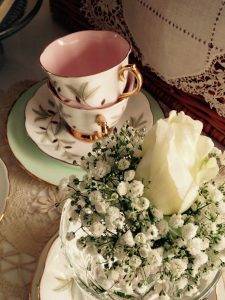 Welcome to a blog about Granny’s China Cupboard – a vintage china hire company based in Poole, Dorset. 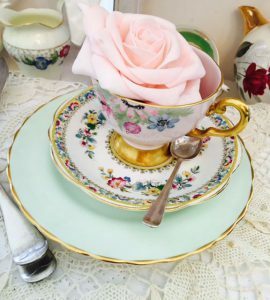 Vicky, the owner of Granny’s China Cupboard, has been passionate about vintage china since a she was a young girl, when she used to play tea parties with her Nanny’s precious tea set which she kept in a very special glass and mahogany cupboard. This was the inspiration for her business and its name – we’re sure her Nanny would approve! Vicky’s collection started as a hobby and is now her business. She’s taken over the house and her husband’s man cave! Luckily he is very supportive, and spends most weekends with Vicky scouring antique shops and auctions, looking for beautiful items to buy. Have you recently got engaged and starting to plan your wedding? Firstly congratulations! This is such an exciting time as you embark on a new life together as a married couple. Thanks to social media and sites such as Pinterest and Instagram it is now much easier to get inspiration and ideas for all budgets and themes, allowing you to personalise your day and “make it your own”. 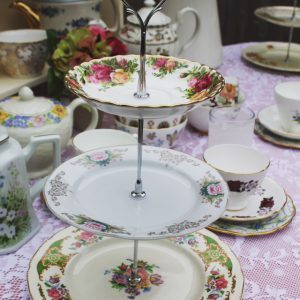 If vintage is your theme, then Granny’s China Cupboard has everything you could possibly need, from tea sets, to hand made two or three tier cake stands, plus a huge range of vintage and shabby chic venue dressing items to hire. Granny’s China Cupboard have an extensive collection of timeless, delicate bone china, perfect for any venue. Their pretty cups and saucers perfectly compliment a marquee, village hall or barn too, if you are planning a DIY wedding. So you’ve set the date and found a venue, the next step would be to visit Vicky for a consultation. This not only allows you to view the china and decide which colours or pieces you would like, you can also browse all of her vintage venue dressing accessories. 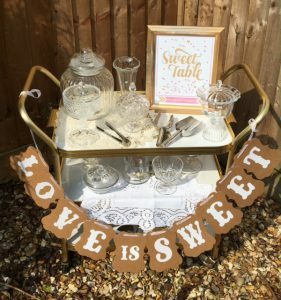 She has a large selection of vintage suitcases, wicker picnic baskets, rustic centrepieces log slices, step ladders and a huge range of glass jars perfect for a sweet table. You can sit down together, have a cup of tea and discuss all of your ideas and requirements. Granny’s China Cupboard deliver and collect from your venue and even take away the dirty crockery so there is no need for your caterer or anyone else to do the washing up. CONTACT Granny’s China Cupboard about your vintage wedding! South Coast Weddings provides wedding planning services across Dorset and Hampshire. From full planning to On the Day Coordination, we can help you as much or as little as you require.